Think of a person you know who always seems to be happy. If you look at their life, is it only filled with positive, uplifting events and experiences? Probably not, but how they look at those situations determines happiness more than the events themselves. In one research program, the conclusion they came to about what makes people happy or not was relatively simple. Happy people tended to look at their lives as a series of positive things interspersed with occasional negatives. Unhappy people, on the other hand, tended to view their life as a series of negative experiences with a few positives thrown in. Often when a new client comes into my office, the answer I get to my question ‘why are you here?’ is ‘I just want to be happy. Have you ever thought about what it means to be happy? I mean, really happy? We know when we feel happy, and know when we are not. We can make a long list of words to describe happy. But what does it REALLY mean? Maybe you don’t think you need a formal definition of happy – we use the term to describe a spectrum of positive emotions. Contentment, well-being, joy. Those are a good start to defining happy. But to really understand ‘happy’ we need to understand the causes and effects of ‘happy’. And we need to start with the definition. In her 2007 book “The How of Happiness”, positive psychology researcher Sonja Lyubomirsky elaborates, describing happiness as “the experience of joy, contentment, or positive well-being, combined with a sense that one’s life is good, meaningful, and worthwhile.” This matches with what people say about their experiences with being happy. It seems to encompass both the emotional state as well as having a deeper meaning and purpose in life. Happy people tended to look at their lives as a series of positive things interspersed with occasional negatives. Unhappy people, on the other hand, tended to view their life as a series of negative experiences with a few positives thrown in. In reality, the basic number of good/bad events was about the same for both groups. It was their interpretation of the events that made them happy or unhappy. The happier individuals had habits that gave them a different perspective of the content of their lives. So what are these habits? Good question! 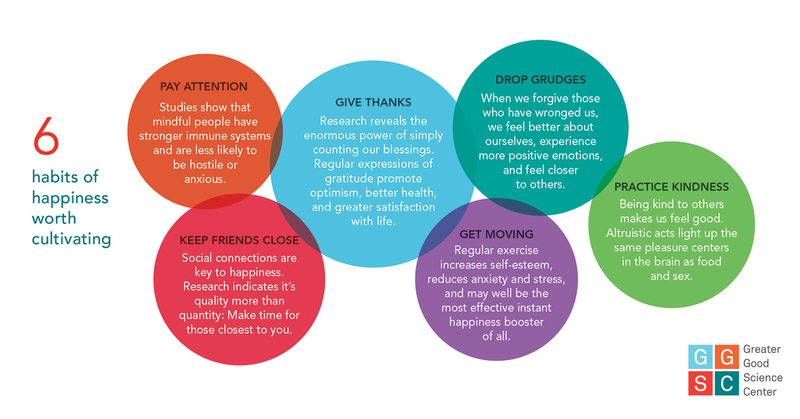 According to the Greater Good Science Center, there are 6 Habits of Happiness. If we incorporate these practices into our lives, the chances are we will experience a higher level of contentment and happiness. Now, being completely real, implementing these habits will not totally eliminate the negative things in your life. But when we are happy and content, we are much more able to cope with whatever comes our way. Why not give happiness a try? Start practicing these 6 Habits and see if it doesn’t just begin to improve your ‘Happiness Quotient’.